The Forum for Democratic Change has responded to the allegations of subversive activities labelled against some party members by ISO boss Col Frank Kaka. Early this week ISO boss paraded a group he claimed was working with FDC to distablize the country. Reacting to the report FDC president Patrick Amoriat Oboi denied that the party has never participated in any subversive activities stating that the allegations put against the party and some of its officials are baseless and unfounded. Oboi condemned in the strongest terms the manner in which party officials were interviewed on camera under duress inorder to make false allegations against FDC. Below is party full statement. We as Forum for Democratic Change have noted with concern the recent attempts by the regime to implicate our party and its leadership in subversive actions. 1. Although we are in the business of taking control of this country, as a political organisation we have never at any one time thought about, mobilised, directed or engaged in any subversive activities intended to overthrow regime. It is therefore unacceptable that the Intelligence Services have chosen to associate our leaders and the party with such actions. 2. We have always stated that the party won the elections of 2016 for which we have concrete evidence. In responding to that development, the Forum for Democratic Change developed strategies for "Reclaiming our Victory". The People’s Government (PG) is part of this and also a result of a resolution of the top management organs of FDC and therefore part of our activities of Reclaiming our Victory. We are openly involved in activities across the country intended to educate and empower our membership in the direction of getting involved in such actions intended to mobilise the population to take control of their destiny as citizens of this country. All this is done in accordance with the existing laws of this country and we do not find any fault in what we do. Therefore, we would like to strongly disassociate ourselves from the claim that we are the perpetrators or promoters of the killings by machete wielding people who have caused insecurity in the recent past. We advise this State to do their work better in respect of this matter. 3. We wish to condemn the manner in which the FDC Busia District Mobiliser Mr John Kasera and his friends where interviewed on television under duress to make a confession. We wish to call on the authorities to produce suspects in courts if law so that they may exercise their right to defend themselves. 3. 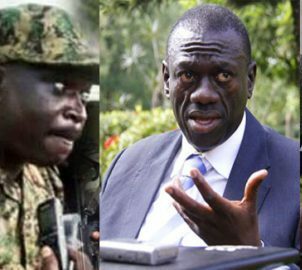 We wish to assure the public that FDC will never resort to removing the current dictatorship by force of arms but will systematically and religiously carry out our duty of bringing change to this country using constitutional means. Any diversions to this will be resisted and held with a contempt that it deserves. 4. We also want to inform the public that the Forum for Democratic Change will in the next few weeks be Conducting a countrywide exercise of Identifying, Recruiting And Training of our structures starting with the grassroots. We do not expect we do not expect any interference from the intelligence services or our rival political parties. 5. Fellow Ugandans should be reminded of the fact that this is our country and it is our responsibility to determine who and how it should be run. We would like to request our members to remain firm and committed to the liberation of this country.